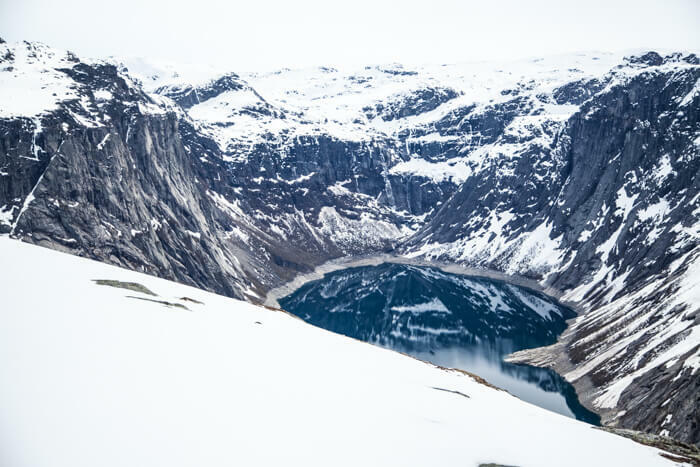 After flying into Oslo the morning of May 7th, we made the scenic drive out to Odda to snowshoe Trolltunga that Saturday, May 9th, with Trolltunga Active (formerly known as Opplev Odda). 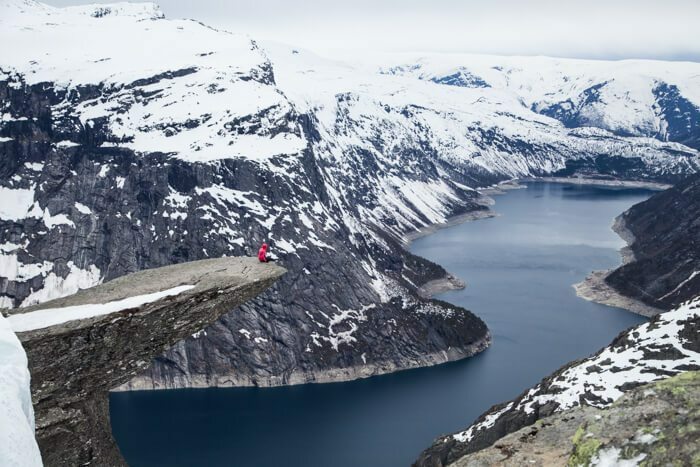 Trolltunga Active operates a number of trips in the Hardangerfjord area including climbing Trolltunga, zipline adventures, kayaking, and more. They’re some really cool and patient people if you ever need a guide! 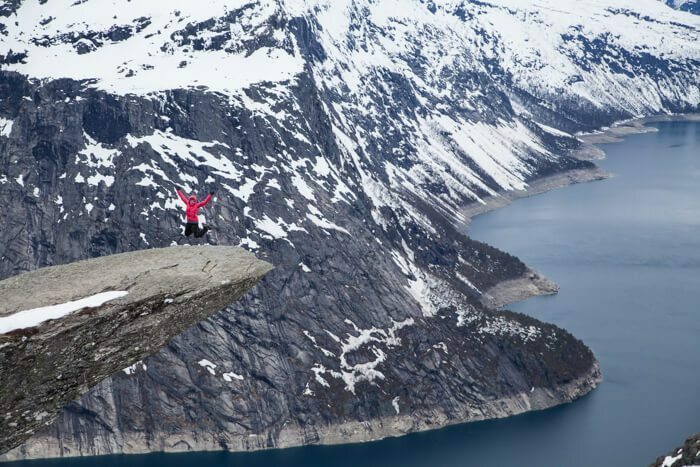 We arrived at their headquarters which is conveniently located next to the Trolltunga trailhead in Skjeggedal. There were about 10-12 participants and three guides. 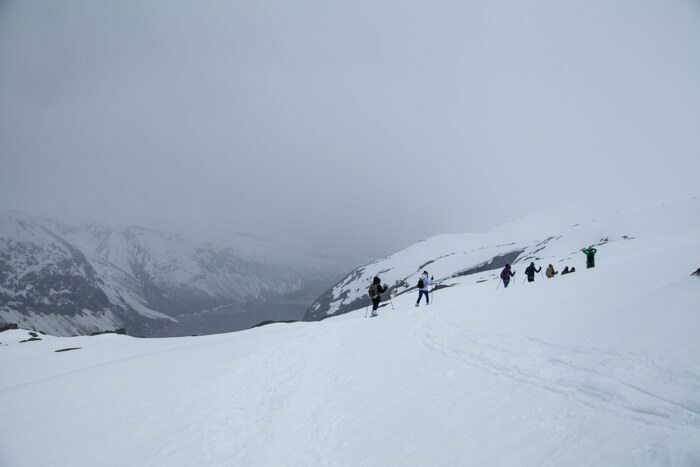 We loaded up our packs with snowshoes and trekking/ski poles to begin the steep ascent up. It’d been raining/snowing on and off a few days before and with the spring snowmelt, the trail was slick and muddy. We hit patches of snow. 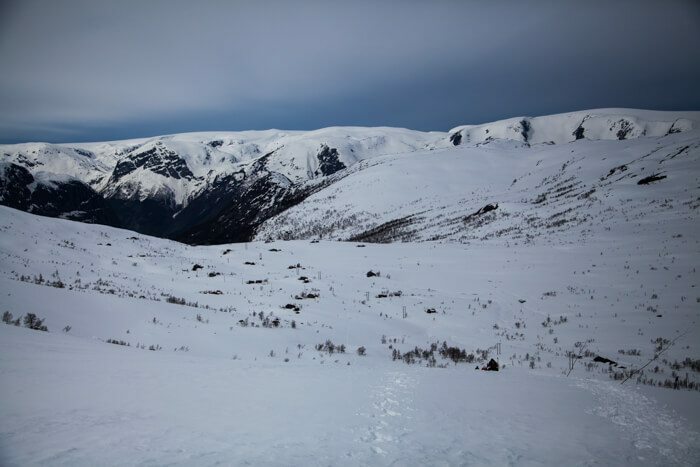 After gaining approximately 1000 feet in elevation, we strapped on our snowshoes and off we went. 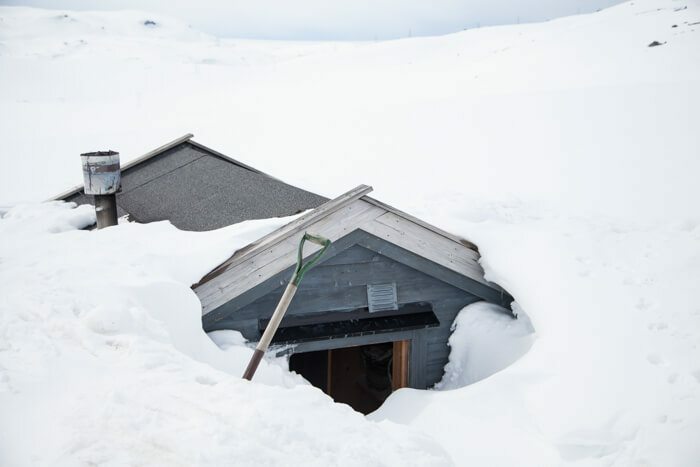 Soon, we were above treeline hiking past cabins buried deep in the snow. Trolltunga itself was super beautiful and quiet. 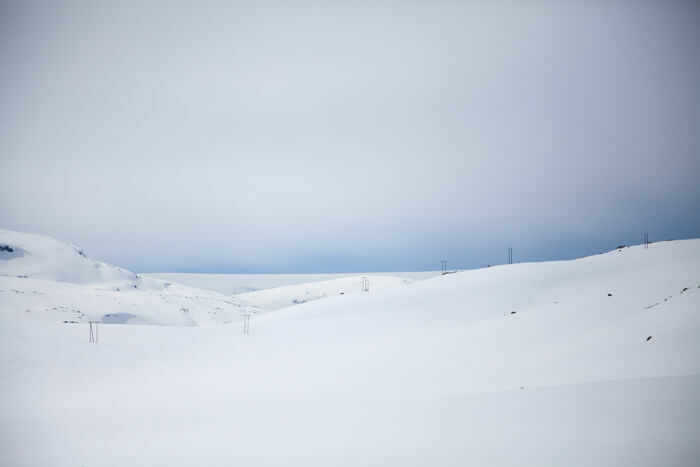 There’s nothing like a blanket of white snow to make everything seem extra pristine. It was a little icy in and around the troll’s tongue, but a rope had been set up to help people climb down to the ledge. The best spot to take photos from is completely iced over right now, but we were still able to stand up above and snap some epic shots. I opted to go with a guided tour because I had no idea what conditions would be like. There wasn’t an option to rent snowshoes anywhere. It was totally doable without snowshoes. Towards the end of the day, the snow was super wet and sticky. There were people who had gone without guides. Due to the snow and new snowfall and lack of visible trail, the party got lost multiple times. One thing about guided trips is that you’re kind of at the mercy of the slowest person in your group. 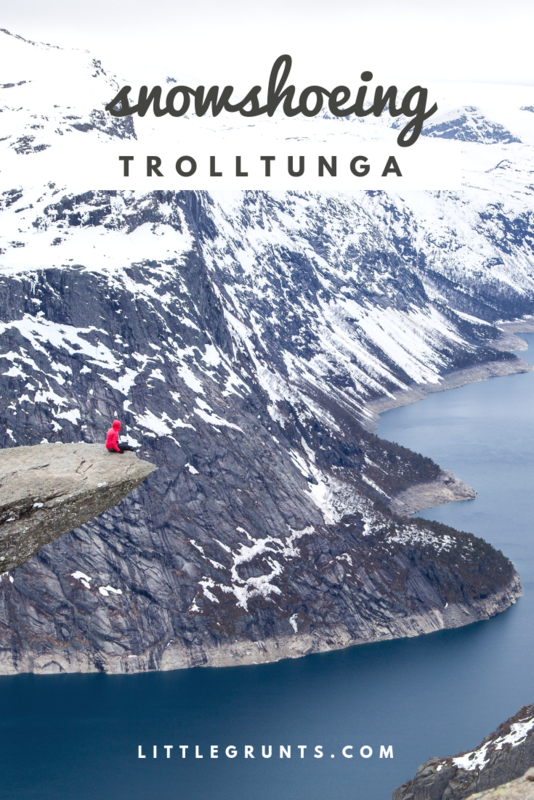 In this case, Trolltunga attracts people of all sorts of fitness and outdoors experience levels from everywhere. (Read: snowshoeing in jeans and sneakers.) Not everyone was prepared for the long day out on snowshoes. We made frequent stops and hiked at a fairly slow pace to keep the group together. On the way out it was much more bearable. One of the guides stayed behind with the slower members of the group while the faster folks headed out. The hike gains about 3000 feet in elevation and is approximately 22 kilometers long, out and back. I’m a big fan of silence and remoteness. 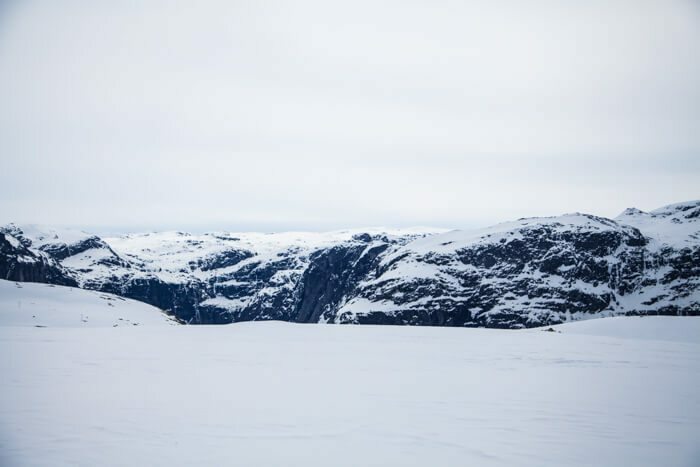 It was definitely preferable doing the hike in the winter; our guides told us that in the summer, there’s a 2-3 hour wait at Trolltunga for photos. The trail is never empty. 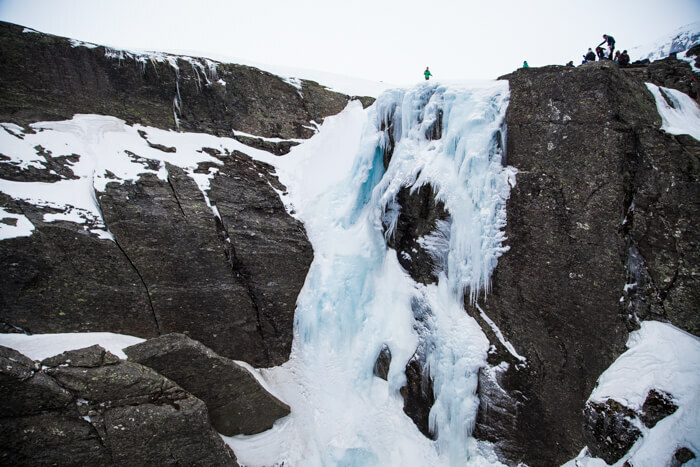 If you decide to come back in the winter, consider booking a via ferrata tour to Trolltunga with Trolltunga Active for something a little different. You bike out from the trailhead to the bottom of the wall, and then climb up the side to reach the tongue. 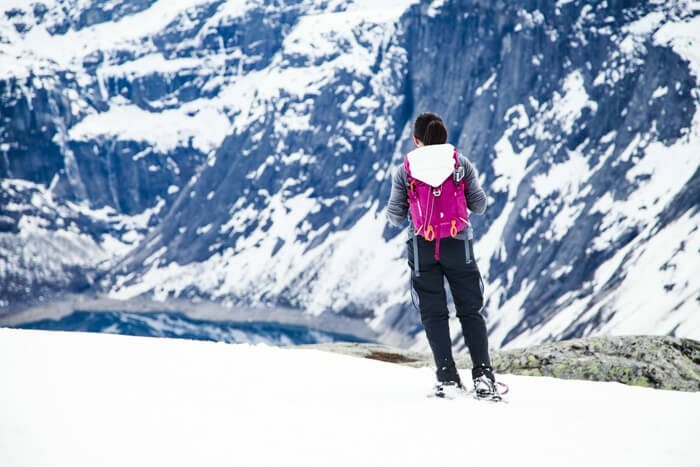 Would you rather snowshoe or hike Trolltunga? 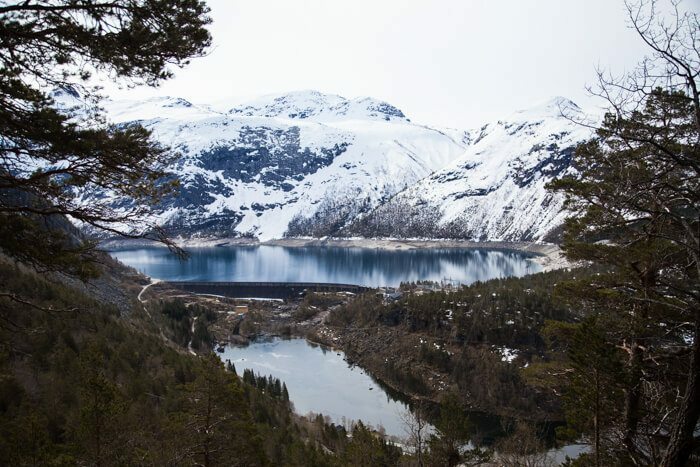 For other things to explore in Norway, check out Modalen, Vettisfossen, and Avdalen Gard. Amazing shots! Just curious, you made the trip last thursday meaning 14/5? Still that amount of snow :S! Oops, I should have specified! I did this on May 9! It might have snowed pretty recently too. 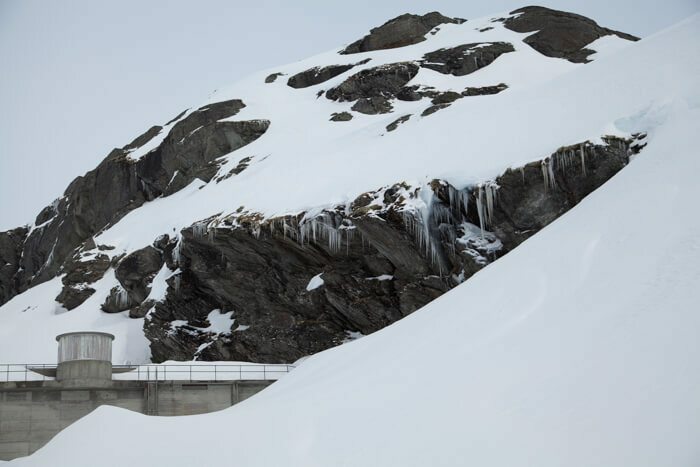 do you think it is doable with snowshoes and without a guide in March? Hi there, yes, but I’m unfamiliar with snow conditions there at this time. Snowshoeing that trip sounds extremely hard. How many hours did it take to go up? I went there with my daugther in july. It was still some snow in parts of the trail, but no need for snow shoes. It was tough enough, though. We met some rather naive tourists that thought that they could do it without bringing food or water. How come skiing with cross country skis was not an option? Looks like it’s enough snow after the first 400 meters. I think it took about 10 hours total? That also accounts for time spent at the rock itself, taking lots of photos and eating snacks. I finished early but there were still others behind us on the hike out.